Patrick Handyman we specialize in a wide array of home repair services and are eager to help you create a great looking house. Our mission is to offer our residential and business customers a professional and reliable maintenance and repair service at anytime of the day or at night. Patrick Handyman fulfills a tremendous range of requests and is eager to help you with all sorts of repairs. Have a special request? Feel free to ask! And More… Just ask chances are Patrick can do it! 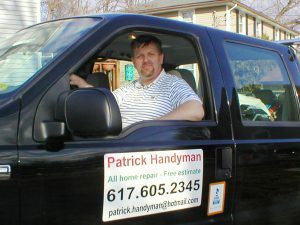 Patrick Handyman Service is fully insured and offers free estimates on any job. When you receive an estimate from us you can rest assured that you’ll never pay more and we’ll never tack on any hidden fees or extras. Our repairs are meticulous to the last detail and your satisfaction is guaranteed.